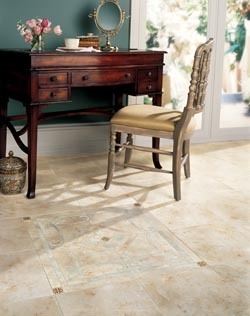 Imagine the classic elegance of tile flooring in Oxford, AL, in your grand foyer, formal dining room, or kitchen. Tile in its many incarnations offers beauty and practicality in decorating. As a matter of fact, tile is prized for its versatile appeal that flatters any design style, as well as its easy cleaning and maintenance. Which Type of Tile Is Right for Your Room? Tile made of different materials for a unique look that offers countless decorating possibilities. Take, for instance, ceramic tile. This flooring type is fired in a kiln, making it durable. It’s also a softer type of tile, which means it’s easier to cut and install. Ceramic has an elegant look that elevates the ambiance of any room. Its sister tile is porcelain, which made from very fine clay fired at very high temperatures. This tile is dense and strong and modern in appearance. Like ceramic, porcelain offers a hard surface that doesn’t trap allergens. This makes it beneficial for people with allergies or asthma. A variety of types of stone are cut into tiles, such as marble, travertine, and slate. Marble is distinctive for its gorgeous veining, while travertine comes in lighter, neutral tones with subtle patterns. Slate, on the other hand, is rich and earthy in rust, gold, blue, brown, and black. Tiles are even made out of glass for a luminous quality. Glass tiles are popular in bathrooms and kitchens, as they resist water and are easy to clean. Like all types of tile, they’re strong and long-lasting. For a distinctive look with your décor, select mosaic tile. These are tiny pieces of tile set into patterns and designs for artistic appeal. This type of tile is perfect for a backsplash that serves as the focal point of a kitchen. Whatever your choice of tile, count on our installation technicians for capable service. Tile can be challenging to install due to the process itself and the nature of the material. Our technicians lay tile on a bed of mortar that sits atop a clean, level, and dry subfloor. They’re precise in measuring, for tile must be cut to fit the outer edges of the floor. Tile that is installed incorrectly can lift, shift, and be subject to damage. To ensure your tiles floors always look lovely, request professional installation. Contact us today to choose the type and color of tile to use for your new flooring. With a showroom in Oxford, Alabama, we proudly serve residential and commercial customers in Calhoun, Talladega, and Lincoln counties, as well as Bynum and Delta, and the surrounding areas.